AthHalf Mobile is a new and innovative way to experience a half-marathon for runners and spectators alike. AthHalf, the Athens Half Marathon, is presented by AthFest, Inc., a nonproﬁt organization dedicated to promoting music and arts education in schools. It is AthFest’s 13.1 mile race touring through the city of Athens. Wouldn’t it be cool if there was a mobile application for AthHalf that not only helped runners train for the race, but also let family and friends know the approximate time their loved ones will arrive at spectator-friendly locations along the course? With AthHalf Mobile, both the runner and spectator have the opportunity to enhance their AthHalf experience. So what does the app do? AthHalf users may choose to register as a runner or volunteer. AthHalf Mobile will then direct them to the event registration page. Participants can ﬁnd information regarding the Health and Fitness Expo. Users will be able to view recommendations for parking and information about street closings. There is also a contact section so users may contact AthHalf through email, phone, Facebook, or Twitter. Runners can use a WoW approved training program to prepare themselves for the race and connect with other runners in training. 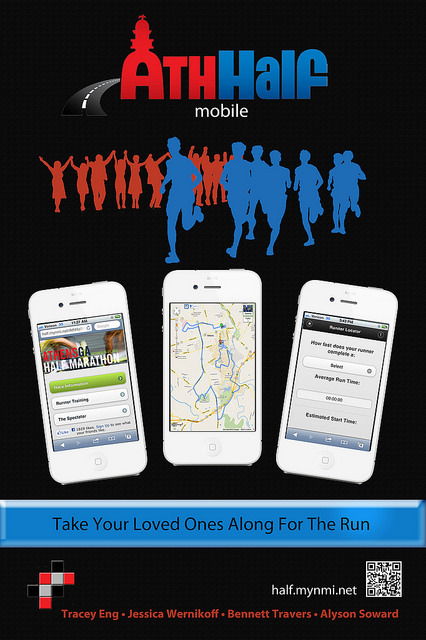 Family and friends will be able to see when their runner will be at speciﬁc locations during the event. Spectators want to see the runner at the start and ﬁnish lines, as well as all around the 13.1 mile course. By entering the runner’s average running time the app estimates approximate times the runner will be passing by a spectator-friendly location. For a go-to for all your questions about AthHalf, AthHalf Mobile is the answer!